photography « Midlife Crisis Crossover! Darth Mauls. Presumably they’ve killed their master so their total Sith count is back down to two again. 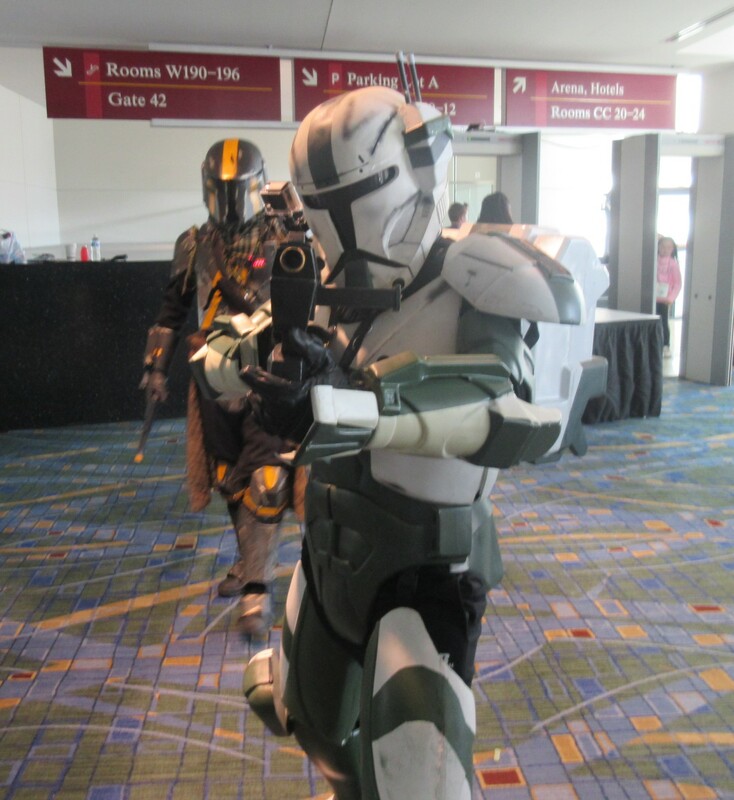 In our last call for cosplay photos, we bring on the bad guys and the gray-area dwellers — the Sith, the bounty hunters, the Mandalorians, and more, more more. Boo hiss! 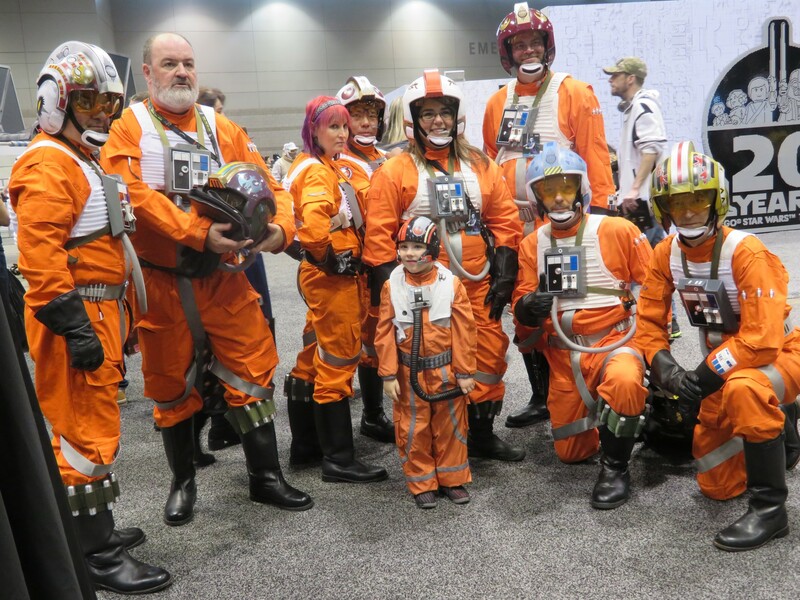 Anyone can wear the X-Wing flight suit. You could wear the X-Wing flight suit. Next up: the good guys! Yahoooooo! 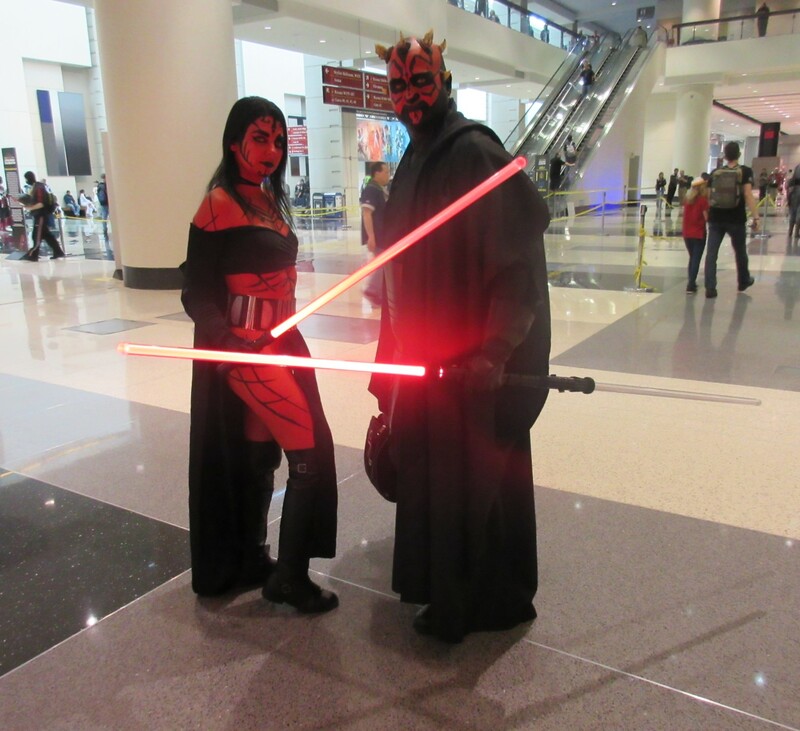 Previously on Midlife Crisis Crossover: April 11-15, 2019, was the ninth American edition of Lucasfilm’s Star Wars Celebration, recurring major convention celebrating their works, creations, actors, fans, and merchandise, not always in that order. After jaunts around the U.S. coast and overseas, this year’s was in Chicago, gracing the Midwest with its products for the first time since 2005. My wife Anne and I attended Thursday through Saturday and fled Sunday morning. We only stayed for three days partly to save money and partly because we’ve learned from past experience that three days is our limit at any given convention before we slam into a mental wall and need respite from geek immersion before we get sick of it all. Based on past posting experience, the most popular part of every convention experience is cosplay, so those photos get to go first. We’re fans of costumes and try to keep an eye out for heroes, villains, antiheroes, supporting casts, and various oddities that look impressive and/or we haven’t seen at other cons. That was a bit challenging with a con about Star Wars for Star Wars by Star Wars starring Star Wars. It’s not as though the other cons we attend lack for Star Wars costumes. But we had fun capturing whoever we could. 1. My wife and I are not professional photographers, nor do we believe ourselves worthy of press passes. These were taken as best as possible with the intent to share with fellow fans out of a sincere appreciation for the works inspired by the heroes, hobbies, artistic expressions, and/or intellectual properties that brought us geeks together under one vaulted roof for the weekend. We did what we could with the tools and circumstances at hand. We don’t use selfie sticks, tripods, or cameras that cost more than a month’s worth of groceries. 2. It’s impossible for any human or organization to capture every costume on hand. What’s presented in this series will be a fraction of a fraction of a fraction of a fraction of the sum total costume experience. Other corners of the internet will represent those other fractions that we missed, which is the cool part of having so many people doing this sort of thing. 3. We didn’t attend Sunday or Monday. As previously explained at excessive length in a previous entry, we also nearly never watch costume contests anymore. Sincere apologies to anyone we missed as a result. 4. Corrections and comments are always welcome, especially when we get to Part 3, which will include at least three characters we young geezers didn’t recognize. We kept up on Star Wars for decades and still remember many of the old-school characters, but we have knowledge gaps vis a vis recent video games, animated series, and lesser extras from the recent films. But I do like learning new names and worlds even if you’re more immersed in them than I am. 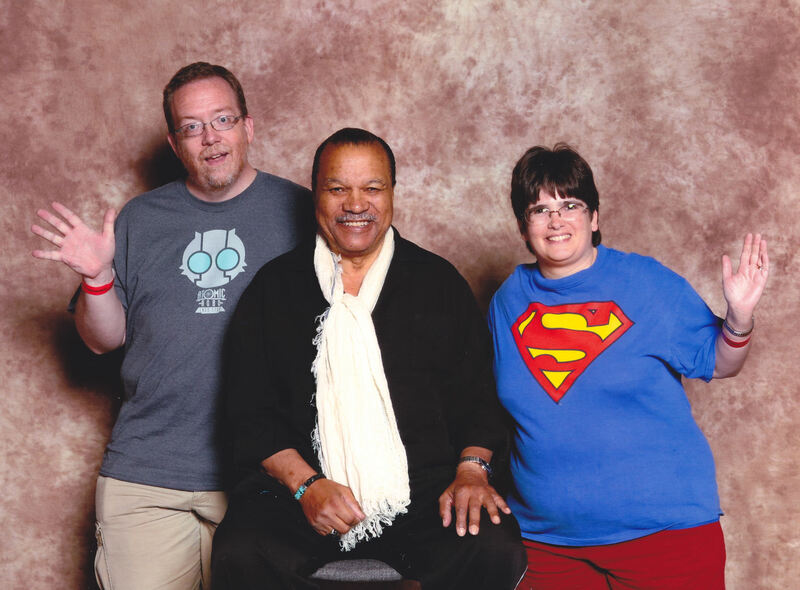 The debonair Mr. Billy Dee Williams at Cincinnati Comic Expo 2016, raising the bar for convention fashion. This weekend my wife Anne and I will be attending the latest edition of Star Wars Celebration, Lucasfilm’s recurring major convention celebrating their works, creations, actors, fans, and merchandise, not always in that order. After jaunts around the U.S. coast and overseas, this year’s will be in Chicago, gracing the Midwest with its products for the first time since 2005. Previously on MCC, we shared our personal experiences with Celebrations 2002 and 2005, which were each held at our very own Indiana Convention Center. We’re happy they’ve turned our direction once more, but a bit flummoxed by a few aspects of the show, which we hope goes well despite our nervousness about a few early warning signs. Bugging us more than anything else is the lack of big, big-name participants from either The Force Awakens or The Last Jedi. We had accepted that there would be a Wampa’s chance on Mustafar of The Mark Hamill coming within a thousand miles of Chicago that weekend after his not-so-great 2017 experience in Orlando. (Ditto Harrison Ford, which we absolutely understand.) But being snubbed by the main casts of the last two non-digressive SW films stings a tad. We also despaired when special guest Temuera Morrison (Aquaman, Attack of the Clones) canceled last week. He was at the top of our must-meet list and has now freed up some of our funds for other activities, such as slightly better Chicago food. 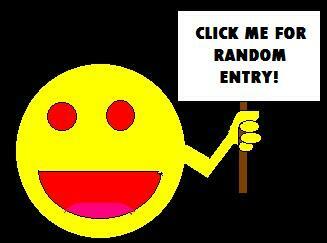 We hope to have fun nonetheless, but of those folks scheduled to attend, we’ve already met many of them. While we’re counting down to opening day this coming Thursday, please enjoy this look back at this year’s Celebration guests that we’ve already met at previous conventions. Please feel free to pretend this is an exclusive sneak preview of the weekend to come. For other folks besides us, I mean. Sunday morning breakfast at Do-Rite Donuts and Chicken. 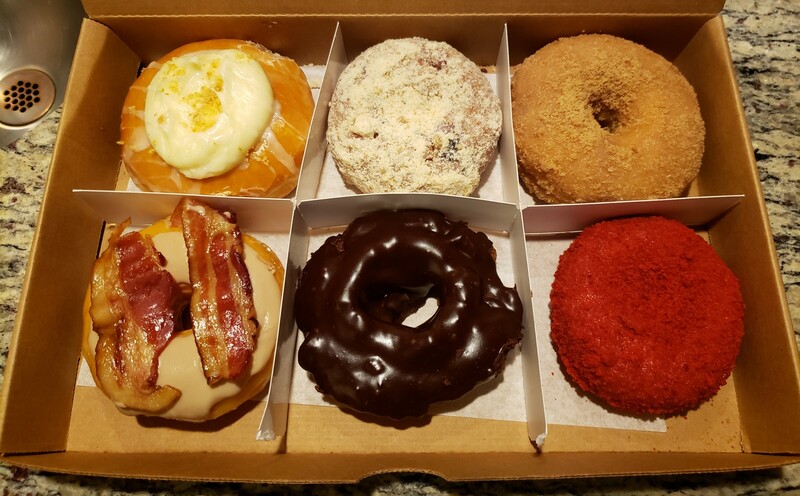 Clockwise from top left: cream cheese Danish, blueberry, cinnamon crumble, red velvet coconut, old-fashioned chocolate, and maple bacon glaze. Previously on Midlife Crisis Crossover: Anne and I attended the tenth annual C2E2 entertainment convention a few miles from downtown Chicago. When time permitted before and after the show, once again we wandered the Windy City and took photos, preferably of places and things we didn’t already see on our last several Chicago comic cons. Y’all know me — any excuse for a travel photo gallery. Indiana as a state has an abysmal track record when it comes to encouraging recycling efforts, but options do exist if you know where to look. 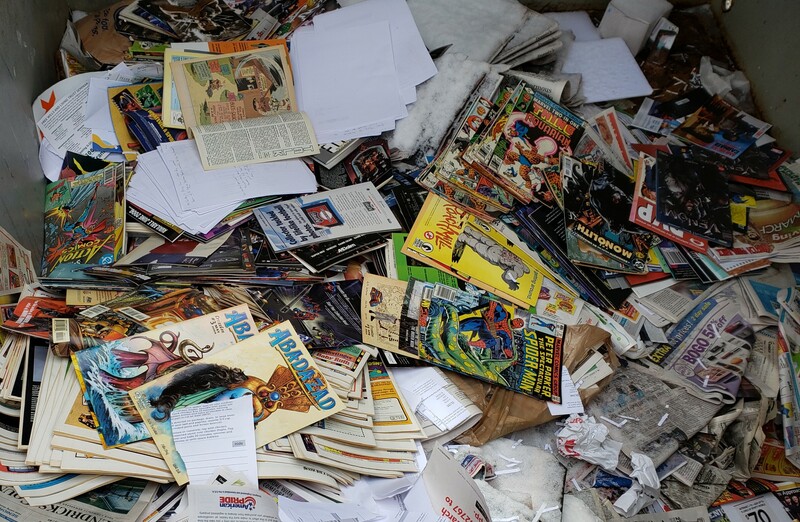 I’ve heard a lot of chatter about Marie Kondo, the lady with the Netflix show who, if I understand all of last year’s internet squabbling correctly, recommends everyone throw away all their possessions except their Top 10, keep only one pet and release the rest into the wilderness, stuff half their food in the garbage disposal, raffle off any jewelry that weren’t featured in magazine articles, or something like that. For the record, I haven’t watched a single episode, so I’ve not been hypnotized and chanting, “I must give away all my possessions and join the KondoMinimizers,” or whatever. No, I’ve been planning the act in the above photo for a few months now — consciously, at least. Subconsciously, maybe a lot longer.